This single level home is absolutely turnkey. It has a spacious open floor plan with opened beamed ceilings, ceiling fans and lots of dual paned windows to let in the light. There are 2 bedrooms and 1 bathroom. The kitchen is roomy and quite charming. The home also comes with central air and heat, as well as wood stove to cuddle up next to on winter nights. This home also comes with a separate laundry room, and 2 front entrances. Outside we have a deck, a fenced yard with a walnut and a cherry tree, a circular stamped driveway with lots of parking and a garage. 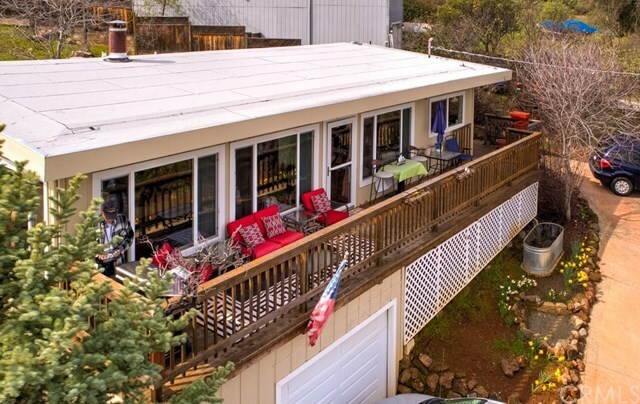 On top of all this it comes with lake and mountain views, and a great price.